Access to authoritative geographic information helps people make better decisions. GeoNOVA is a gateway to geographic information in Nova Scotia. We encourage collaboration and sharing of geographic information, expertise and technology across government. Geographic Information Services (GIS) is the designated mapping service provider for the Province of Nova Scotia. As part of the Information, Communications, and Technology Service Branch of the Department of Internal Services, the GIS section provides government and public with Foundation Geography and GeoServices. GeoNOVA partners contribute to the Nova Scotia Geospatial Infrastructure to support the discovery and delivery of better information, products and services. Geographic data, products and services are available from participating departments and agencies. Learn more about our GeoData / Partners. 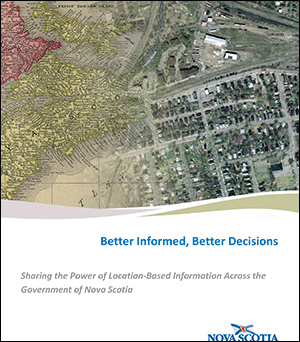 Geographic information supports the Government of Nova Scotia in achieving excellence in decision making and service delivery. Provide government & public with shared access to authoritative geographic data, maps & geographic information applications. Create a governance structure that ensures effective use of geographic information. Integrate geographic information & expertise into government activities.